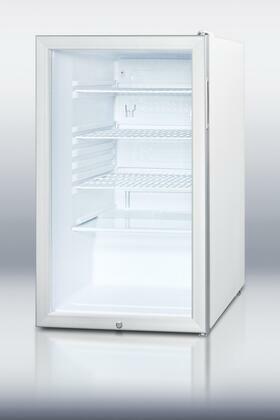 The SCR450LBIADA is a 20" wide all-refrigerator with a 4.1 cu.ft. capacity. It has a white cabinet with a reversible glass door and keyed lock. A hospital grade cord with a 'green dot' plug offers additional safety in high traffic areas. 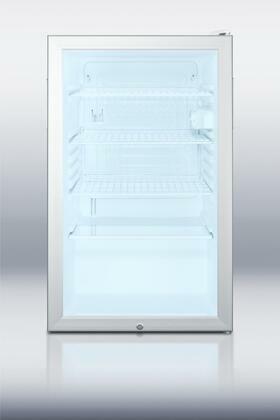 Inside, the SCR450LBIADA includes adjustable shelves for attractive and convenient storage. The interior light functions on an on/off rocker switch and an adjustable thermostat offers easy temperature control. At just under 20" wide, SUMMIT SCR450LBIADA is ideally sized for any ADA compliant setting and can function as a built-in or freestanding unit. I was hesitant about ordering a refrigerator online. When I'd purchased smaller appliances like a microwave and a blender previously, they arrived with some kind of damage and could only imagine what could happen with something as large as a fridge. Based on friends' recommendations, though, I went through AppliancesConnection.com. The delivery people were professional and treated my home with care. Would recommend them to others. Spacious, well-lit, and works great exactly one year later. This refrigerator was my first major appliance purchase and I'm pretty proud of myself after all the research I did. Last year, my partner kept complaining about our old refrigerator and always showed me refrigerators that are similar to this one. Finally, I decided to purchase this for her and she loved It. From the moment we received it, she has been telling me how much she love the design, features and the extra space on the side door for milk and other products.